When it emerged that the late popstar Prince died without apparently having made a will, a long legal battle began, to find out who would inherit his estate. He has six siblings, one of whom is a full siblings, with the other five being half brothers and sisters. So do they share equally in an estate reported to be worth anything from 100 million and $800 million? One thing is for sure, it will take years to sort out and is a lesson to everybody who is yet to make a will that they should get on and do so. 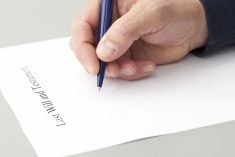 Making a will: why do I need one? We have seen from the example of Prince that to die intestate can lead to months, or even years, of discussions over who inherits your estate. Many assume that their estate will automatically pass to their nearest and dearest, but this isn’t necessarily so. If you are not married or in a civil partnership, your partner won’t automatically inherit. If you are separated, but not divorced, your estranged spouse will inherit. And, even your estate does go to your loved ones eventually, if you had made a will there would be no need for them to wait so long. Despite this, a recent survey revealed 60 per cent of the UK adult population does not have a will. Most of these are among younger people, but 35 per cent of those aged 55 and over also have no will. Ten per cent of people believed their estate would automatically go to the right people. But as we’ve said, if you die intestate your assets are distributed according to the law and not according to your likely wishes. At Hartsfield, we work closely with associates who are qualified in will writing and who will help you to put your wishes into a legal document. Please get in touch. Hartsfield Financial Services Limited is authorised and regulated by the Financial Conduct Authority (FCA) and is entered on the FCA register (www.fca.org.uk/register) under reference 615731. Information about the Financial Ombudsman Service (FOS) is available from their website: http://www.financial-ombudsman.org.uk. The information contained within this website is subject to the UK regulatory regime and is therefore primarily targeted at consumers based in the UK.